I always wanted children and I knew I would not feel fulfilled without them. Therefore when I was told in my mid 20’s that children were not possible, I immediately began the adoption journey. In 1986 my beautiful daughter Aimee was placed with me. I was so happy to have a child and Aimee has always been a delight to all the family. From day 1 she was as much my daughter as she would have been had I given birth to her. You can imagine my shock when at the end of my 30’s I discovered I was pregnant. I was so worried about my age and the effect it would have on Aimee. I had all day sickness and therefore I was given a scan at 8 weeks, shock number 2, twins were on the way. Aimee accepted the pregnancy straight away and she was excited to see her 2 sisters. At 23 weeks and 6 days I did not feel well and went for a check up at the hospital, they kept me in and during that night I went into labour. I was very fortunate to be transferred to the RVI the regional centre. Despite trying to stop the labour Professor D had to do an emergency C section due to a prolapsed cord. Beth did not cry she just grunted and then Sophie came out and cried. The babies were whisked away and I did not know what had happened to them. I was taken to recovery and after a while I was asked to agree to them stopping trying to resuscitate Beth, she was brought to me , she was wearing awful clothes and I asked Mam to go home and get some of her own clothes to wear. Beth was christened in my arms. I wanted both babies to be christened together but it was not allowed and therefore Sophie was christened on the ward without me being there. I held Beth for such a long time before I had to let her go. Sophie was 750gms born and I had had only 1 dose of steroids and she was difficult to ventilate. Much later on that night I was taken to see Sophie, the incubator was filled with condensation making it hard to see this tiny baby. I couldn’t touch her. Over the next few days life became very hard to deal with. I am a very maternal Mam and all the basic instincts of a Mam were impossible to carry out. I could not feed her, nurse her, bath her, change her nappy and worse of all my arms ached to hold her so badly. She was actually 6 weeks old before I held her for the first time. She was still ventilated and it was awful to hear the nurse say that is long enough now. She was my baby and I wanted to hold her. When I was not allowed to touch her I would talk through the incubator all day, when I could touch her I would stroke the side of her face and talk to her all day. As a baby at home and a toddler Sophie would go to sleep stroking my face in exactly the same way as I had stroked hers. When she was on trigger a senior sister recognized that she made more effort when she could hear my voice so she made a tape of me talking and she would play it during the night when Sophie was unsettled. I agreed to hold the funeral of Beth, I had held off because if anything happened to Sophie I wanted them to be buried together. A truly awful day. Staff made little reference to Beth other than to refer to Sophie as the surviving twin on the ward round. I would get very upset when they had to stop feeding Sophie when she was unwell as I felt this was all I did for her and I would proudly hand over my expressed breast milk to the staff. Her first bath was also done by a nurse at about 10 weeks old with Aimee and myself watching. Sophie encountered just about every possible problem, she needed her duct doing at 3 weeks. What an awful day that was. In those days you were not allowed to go with the baby to the hospital where the surgery was to take place, so my Dad stayed with me and just talked at me all day. I really did not think Sophie would return alive, but my little miracle did! She then had cryotherapy on both eyes . The worst thing I think that happened was when her hand went black and I had signed consent for them to remove her hand. The doctors including a vascular surgeon from another hospital spent all day ringing all round the world to see if anybody knew of a drug they could try that would not cause a bleed on the brain. Eventually at the 11th hour a doctor in Australia I think suggested a drug to try and bit by bit from the wrist down her hand regained its colour. An amazing achievement by the staff yet again. Sophie suffered many infections and when she reached 1kg it felt like I had won the lottery. Changing her nappy was the highlight of my day. Leaving her was unbearable, but I had to go home to sleep and to see Aimee . On a weekend Aimee would come to the unit with me and the nurses would play with her and put oxygen tubes on her dolls. 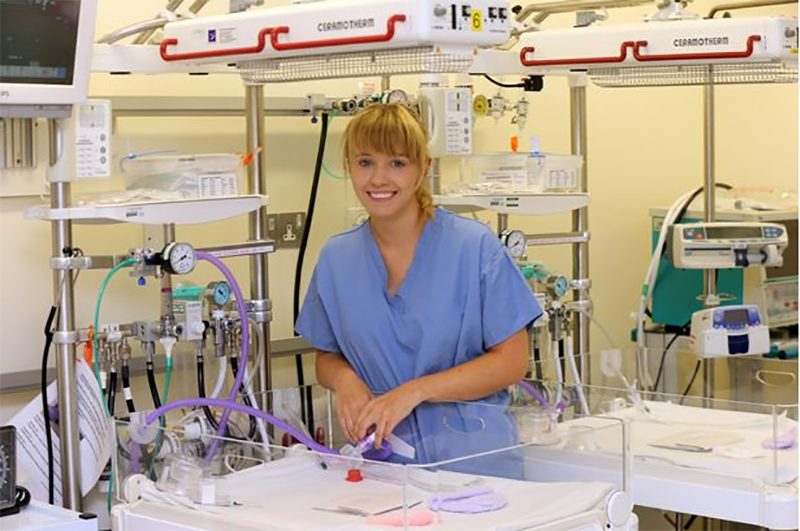 From this experience she herself choose a career as a neonatal nurse. Sophie was on a lot of oxygen 1.5litres per minute which was a lot of oxygen to come home on but on August 11th Sophie was allowed home. A day of great joy and great fear. She was on a saturation monitor due to her dependence on oxygen. She was not allowed to meet other children as an infection would be too dangerous to her. She was also not allowed in aircon for the same reason. Sophie had regular check ups and at about 14months Sophie came off oxygen. Feeding Sophie was a nightmare, this was due to scar tissue from ventilation. Feeding remained a problem until her teenage years. Sophie was very thin and would be sick most nights. At times she would have desaturations and she was therefore quite physically inactive as a child. She was very bright at school and she was placed on the gifted and talented register for her ability in English. She received very good GCSE grades and went on to gain excellent A Levels in Human Biology , Geography and English Language. During her 6th form Sophie went to Africa and worked with children who were homeless, children who had aids and street children. In Sophie’s words it was like comic relief in front of your eyes, she described it as the best and worst experience of her life. I remember when she said she wanted to go to Africa I rang Nick hoping he would say no way can she go when in fact he was yeah of course she can go !!!!! From 6 years old Sophie worked as an ambassador for the charity Tiny Lives. She gave speeches in front of hundreds of people; she made a promotional dvd with 2 premiership footballers. She organised for the charity to be the charity of the year for a large local hotel for 3 years running. She came up with a plan for a reunion Christmas party to be held every year so parents and children can meet up and gain support from each other. This has gone on from strength to strength and now has nearly two hundred children there every year. These are to name just a few. She feels a great sense of commitment to paying back, raising awareness of premature babies and their outcomes. She then started university 2 years ago to study for a BSC in Child Health and her dream job is to work on the unit at the RVI and somehow I think she will achieve that !!!! The only thing the doctors have been wrong about was they thought would be in and out of hospital with chest infections etc but this has not happened. My thanks to the amazing team at the RVI for all they have done in particular Dr Embleton. The death of Beth was not dealt with at the time by me and I did not realise how much damage had been done. When my daughter was pregnant I became very anxious to the extent that I could not go out to events I gave holidays away and I was so anxious it was awful. I had nightmares of babies in white coffins etc. I paid for medical hypnosis and I was diagnosed as having post traumatic stress caused by my daughter being pregnant and me not dealing with the death of Beth properly. I would urge all parents who have a multiple pregnancy where all babies do not survive to get expert help at the time.